A German radio report announced in April 1943 the location of a mass grave in the Katyn Forest. The Germans had captured the city and surrounding area in July 1941. Immediately, Germany blamed the Soviet Union for the decaying men in the mass grave. The Soviet Union denied any knowledge of the atrocity and blamed Nazi Germany. After all, the world was just beginning to understand the horrors committed int eh name of racial purity by the Third Reich. It was feasible that they also had killed thousands of men int he Katyn Forest. Poland had been a thorn in the side of the Russian and Prussian Empires. Since the 9th century the Kingdom of Poland and later the Polish-Lithuanian Commonwealth had invaded and conquered German and Russian territories expanding the Commonwealth into most of modern-day central Europe. Poland went through three partitions and by 1800, it no longer existed. After the First World War, Poland returned to the map but largely in name only. The Red Army and Nazi Germany fought over Poland throughout the second World War. But their fight continued as official hostilities ended. As issue was which of the two nations murdered over 4000 Polish officers and buried the in the forest. This is the story of the Katyn Massacre. Smolensk under German occupation, 1941. Wikipedia. Allied forces paid little attention to the Polish Republic during the 1930s. This apathy allowed Adolph Hitler to send in his German troops to take over Poland uncontested on September 1, 1939. Britain and France demanded that Hitler immediately withdraw, he refused, and the Allies declared war on Germany. As part of Operation Barbarossa, Germany invaded the western section of theSoviet Union in June 1941 with the idea that Poles would be used as slave labor in the Nazi war effort to capture Moscow. Germany captured Smolensk on July 16, 1941 and remained in control of the region, roughly 220 miles west-southwest of Moscow, until libration in 1943. Smolensk and its surrounding forested region was a strategic location and had been captured in earlier centuries by the Mongol Empire, the Polish-Lithuanian Commonwealth, and the First French Empire. When German soldiers invaded, they uncovered a horrific site. 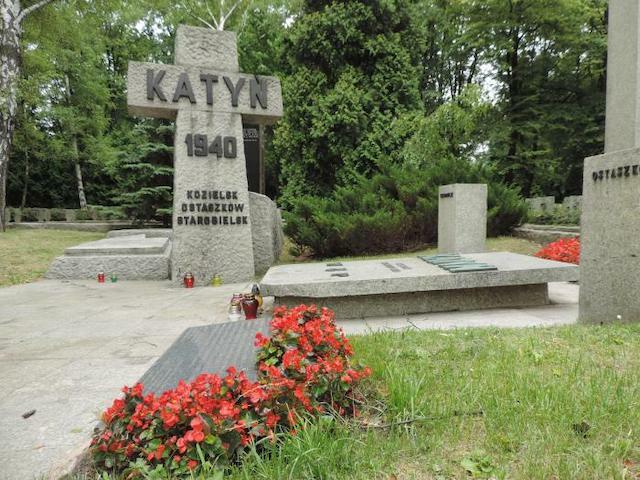 In the Katyn Forest outside of the city was a mass grave of over 4,000 men. The men were identified as Polish army officers. A German radio broadcast on April 11, 1943, announced the discovery in the now-held Soviet territory. Germany blamed the Soviet Union for the crime while the Soviet Union denied any knowledge or involvement and declared that the Nazis were responsible. The Polish government had been operating in exile in London since the late 1930s. It demanded that Allied forces begin an official investigation into the Katyn Murders. Since the site of the mass grave was in Soviet-held territory and the Soviet Union was also an ally, the Allied forces refused. Instead, they oversaw the exhumations of the Polish officers by the International Red Cross. For five weeks, bodies were removed, examined, and identified using mementos, personal letters, and Soviet military orders that remained on most of the dead. Exhumations of Polish officers in the Katyn Forest circa 1943. Google Images. Newspapers in London and New York began to publish accounts of the mass grave found in the Katyn Forest and identities of the men. Polish people throughout the world were outraged. The Soviet Union refused to participate in the Red Cross investigation. Instead, they began their own investigation that quickly concluded that Polish army officers were murdered by the Third Reich. Despite Germany’s repeated denial, it was easy to believe the outcome of the Soviet-led investigation in light of the information surfacing about Nazi death and concentration camps. For Polish people, something was amiss. Since 1939 over 15,000 Polish army officers had disappeared. Most were taken as political prisoners and shipped to labor camps to the interior of the Soviet Union. Many were permitted to write to loved ones in Poland while others were never heard from again. The Polish Ambassador in Moscow pressed Joseph Stalin for answers. Stalin replied that he would look into the matter. When the mater was not seriously investigated, Polish nationals and government officials in London wholeheartedly believed that he Soviet secret police had simply murdered the Polish officers.